Philip Edward "Phil" Hartman was a Canadian-American actor and comedian who was originally intended to be the voice of Zapp Brannigan. He was most notable for his work on Saturday Night Live, and during the 1990s he became a semi-regular performer on The Simpsons. Because of his extremely positive reputation among Simpsons cast and crew, when Matt Groening developed the characters for Futurama, Zapp was created specifically for Hartman. But Matt Groening says that Hartman insisted on auditioning for Zapp’s voice anyway and “he came in, and of course he nailed the part”. 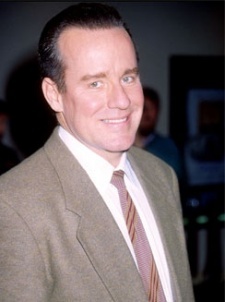 Tragically, Phil Hartman was murdered on 28 May, 1998 by his wife Brynn at age 49, just a few weeks after the audition. No dialogue had been recorded, and so the part was given to Billy West. In tribute, Zapp’s voice was modeled in the same style that Phil Hartman had intended for the character, and Philip J. Fry gained his first name in honor of Hartman. Groening, Matt. Commentary for "Love's Labours Lost in Space" on Volume One, disc 1. ^ Keller, Joel (15 June 2006). "Billy West: The TV Squad Interview". TVSquad.com. Retrieved on 03 March 2011. This page was last edited on 13 April 2012, at 01:53.